Plaque psoriasis is a type of psoriasis, in which silver whitey scales formed on raised red patches. And these patches are generally itchy and painful. These patches can even crack and bleed sometimes. Common areas where plaque psoriasis infects are elbow, knee, scalp, and lower back. It is important for you know how to treat plaque psoriasis, and get it treated because if left treated can result into extreme inflammation and exfoliation. Plaque psoriasis is treated with tropical methods when the condition is mild, with Phototherapy when the condition is moderate and with Systemic agents when the condition is severe. 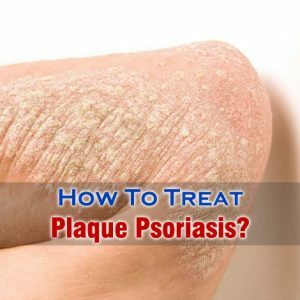 You need to remember one thing about plaque psoriasis treatment that there is no permanent cure for psoriasis, and it can only be managed. So, How To Treat Plaque Psoriasis? Treatment for plaque psoriasis is generally depends on severity and intensity of the condition. When the plaque psoriasis is mild, it can effectively manage with tropical treatments. Using these treatments show positive results when used for 6 to 8 weeks. Firstly, the white scales disappear, and then slowly the red bump flattens. In some cases of plaque psoriasis, combined tropical treatments approach is carried out for treatment. Some of the available tropical treatments for plaque psoriasis include cool tar, corticosteroids, retinoids, etc. As discussed earlier, when the severity of plaque psoriasis is moderate phototherapy is used. Phototherapy is also used when the plaque psoriasis has spread extensively. This therapy involves in exposure of the affected area to the ultraviolet rays of specific wavelength. Generally, two types of phototherapy are used for treating plaque psoriasis namely ultraviolet B (UVB) irradiation and Psoralen plus ultraviolet A (PUVA) irradiation. The affected skin cells growth reduces with the exposure of ultraviolet rays. When UVB exposure is unable to treat effectively, doctors may go for PUVA. This involves usage of ultraviolet A exposure and oral medications. Usage of systemic agents involves taking of oral medications, or injections. This type of treatment is generally when the plaque psoriasis is severe and non-responsive towards tropical treatments, and phototherapy. Systemic agents used are of two types namely non-biologic systemic treatments and biologics. Non-biologic system medications generally used in combination with tropical treatments. Non-biologic system medications include retinoids, ciclosporin, fumarates, methotrexate, and hydroxycarbamide. Biologics are manufactured proteins. The autoimmune process , which involves in psoriasis is interrupted by using biologics.